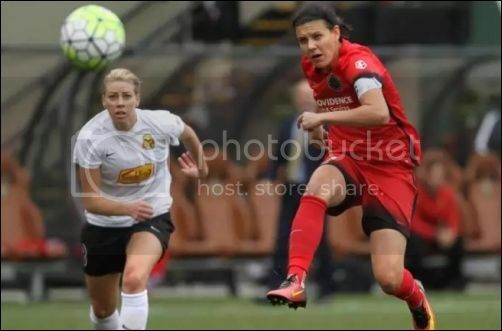 October 2, 2016 -- Portland Thorns FC fell 4-3 in extra time to the Western New York Flash in the 2016 NWSL Playoffs in front of 20,086 fans at Providence Park on Sunday afternoon. The Flash got on the board first when midfielder Sam Mewis struck a powerful, low shot from the top of the box to beat a diving Michelle Betos and give her side the 1-0 lead. Then, in the 38th minute, the Flash struck again, this time through midfielder Makenzy Doniak's header. Doniak rose up and finished a pinpoint cross past Betos to give the Flash the 2-0 lead. Just seconds later, however, the Thorns stormed back to cut that lead to 2-1 when Christine Sinclair volleyed home a Katherine Reynolds long ball past sprawling Western New York Flash goalkeeper Sabrina D'Angelo. The Thorns then equalized in the 77th minute when defender Emily Sonnett blasted home a rebound after D'Angelo failed to clear the ball after coming off of her line on a Thorns free kick. But the Flash came back in the 97th minute when forward Lynn Williams put one past Betos after the Thorns defense failed to clear the ball from the box. Then, in the 103rd minute, Williams made the match 4-2, expertly finishing past Betos following a Flash counterattack. Thorns midfielder Lindsey Horan showed the team's fight in stoppage time of the first extra time period, finishing past D'Angelo after a mad scramble in the box to make it 4-3 but Portland could not find another goal.